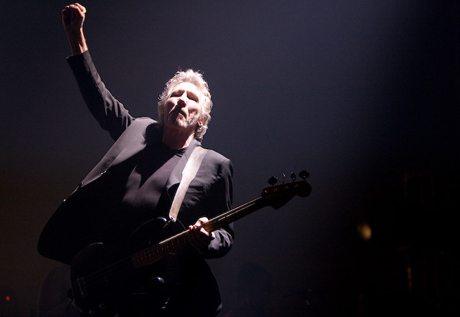 Now that Roger Waters has concluded his revival tour for Pink Floyd's The Wall, the iconic British musician has revealed he's begun working on his first rock studio album in over 20 years. Speaking with Rolling Stone, Waters confirmed that he's currently in the early stages of putting together a proper follow-up to his 1992 effort, Amused to Death. Perhaps unsurprisingly, it's shaping up to be a conceptual piece. "I finished a demo of it last night," he said. "It's 55 minutes long. It's songs and theatre as well. I don't want to give too much away, but it's couched as a radio play. It has characters who speak to each other, and it's a quest. It's about an old man and a young child trying to figure out why they are killing the children." A title has yet been given to the project, nor when it's expected to arrive. It's also unclear if the 70-year-old will support the release with another massive tour. "I'm suffering a little bit of withdrawal after ending the Wall tour," he confided. "It's sort of a relief to not have to go out and do that every night, but they're such a great team. There were 180 of us together everyday. That piece was very moving every night." Waters wrapped up the Wall tour in September, having staged the performance 219 times at arenas around the world, including Canada. "I can't top that tour," Waters added. "First of all, you have to accept the fact that I'm not going to live forever. I'm 70 years old. You just have to accept that when you do something as enormous as that tour. The hardest thing in the world is thinking of something to do, so going and doing it is a reward in itself." While the artist hasn't issued a solo rock LP since 1992, he did issue his Ça Ira opera in 2005.